Champagne Jean Milan has 6 hectares in Oger in the heart of the Côte de Blancs, famous for its Chardonnay, and they exclusively grow Chardonnay. They make only 9000 cases a year yet are not that hard to find in the USA, and their vineyards are approximately 27 inches of rich organic topsoil with a chalky subsoil. Oger is between the better known, although not necessarily better, Chardonnay growing villages of Cramant and Le Mesnil. 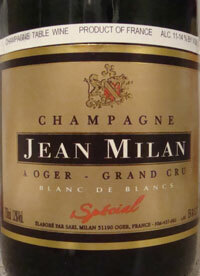 Jean Milan is a Champagne maker at an obviously very high level, but they have had some problems in the recent past, which are hopefully over. In the words of influential critic Antonio Galloni of The Wine Advocate, clearly a fan, they have been "wildly inconsistent over the last few years, far more so than at any other domaine of this level in Champagne." These problems may have been in their bottling and now merely history. Legally speaking, Jean Milan is no longer a Grower Producer and has become a Negociant as they now buy more than 5% of their grapes from old friends of the family that they know and trust who have Grand Cru vineyards. French law is quite complex, but they technically can buy up to 5% of their grapes, no more, and still be a Grower Producer. This technicality of French law doesn't concern me; they are still a small family owned winery so I'm including them with Grower producers. Since all their vineyards are Grand Cru, and there are no Grand Cru vineyards for sale, they could only expand production by buying more grapes. Those who know me will agree that I care more about truth and beauty than arbitrary laws, and this is a "truth," perhaps meaning elegant and pure, and certainly "beauty," a beautiful set of wines based on what I've tasted. Champagne Brut 'Speciale' - the houses standard Non Vintage, tasting note below. 'Millenaire' Brut - one step up from the "Speciale" with an additional year aging on its lees. Champagne 'Symphorine' - their vintage wine. Critic Antonio Galloni loved the 2005, giving it 94 points and saying "incredibly pure, deep, imposing wine with tons of power and breadth, yet it never comes across as heavy" amongst other wildly positive comments. Champagne Blanc de Blancs Grand Reserve 1864 - Non Vintage, based on older wines and aged in oak. A fantastic Blanc de blancs and Antonio Galloni recently gave this 94 points. Champagne Cuvee Tendresse Sec - their sweet Champagne, although at 18 grams of residual sugar, it's only slightly sweeter than some big commercial houses Brut. In case you might think that sweeter Champagnes aren't manly, importer Terry Theise says (perhaps half jokingly) "I will be drinking lots of this and I have more testosterone than the entire World Wrestling Federation, so there." Cuvee de Reserve - a Non Vintage fermented in old oak barrels from Mersault. When fresh this may need cellaring for 3-5 years to maximize pleasure. Rose 'Glamour' - their only wine that is not 100% blanc de blancs, containing some Pinot Noir from 1er Cru Avenay Val d’Or. The nose is initially yeasty with lots of apple, smidgen of peach, maybe a touch of menthol and long graceful chalk. On the palate this is very refreshing, with fresh apples, long and juicy, simply aristocratic, and a touch of lemon/orange as it warms. How can I not love this? Goes well with Chicken nuggets by the way! A rich yellow color with a touch of amber. Impressive packaging as you can see from the picture. Includes a disgorgement date on side label. Note that "1864" only appears on the back label. Non Vintage, based on older wines, and aged in oak. The older wines and oak are obvious once you experience the wine. The nose has ripe apple peel, spicy minerals, and an interesting low-toned earth like quality which is very nice. Fresh cut apple as it warms and breathes. Sand dollar or similar marine quality with time. The palate has menthol like spiciness, ripe (but not overripe) apple , a touch of red fruits on the backend. Creamy sweet orange as it warms. Definitely pull this one from the refrigerator an 1 hour before drinking. Like lots of classy juice, it got better as it warmed (and breathed as well). Exquisite mouthfeel - light, elegant, and airy, with tangerine, green apple, and lemon-lime. Delightfully well balanced and very long. Rich as creamy. This is not a lightweight despite it "light, elegant, and airy" descriptors. 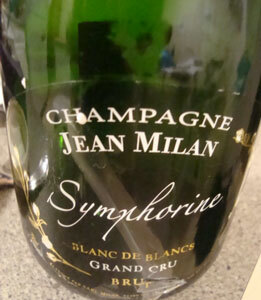 A wonderful Blanc de blancs. This nearly gave me a hard on. Next time I will share a bottle with my paramour!